Spruce up your dining room with the Neiro Arm Less Modern Dining Chair Gray or use in an office for a modern twist on office furniture.These Spruce up your dining room with the Neiro Arm Less Modern Dining Chair Gray or use in an office for a modern twist on office furniture. 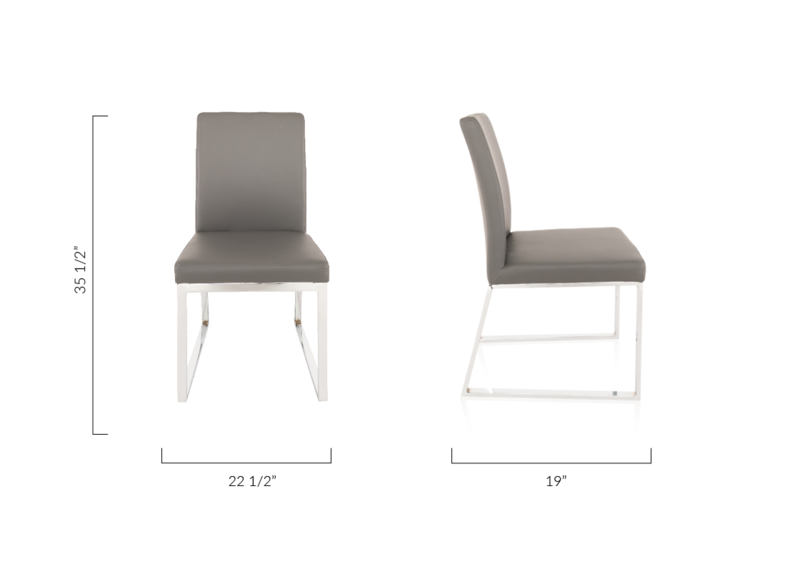 These contemporary dining chairs are made with polished stainless steel and a luxurious rich gray leatherette. Grab one of Modani Furniture's glass dining tables and pair with several of the Niero Arm Less Modern Dining Chairs in gray-- these long-lasting beauties bring a simple but earthy feel to your dining room. Spruce up your dining room with the Neiro Arm Less Modern Dining Chair Gray or use in an office for Spruce up your dining room with the Neiro Arm Less Modern Dining Chair Gray or use in an office for a modern twist on office furniture. L:19" * W: 22 1/2" * H:35 1/2"